MacClean comes to initiate a new round of spring cleaning on your Mac with great technology and services. In addition to your familiar Mac cleaning and OS system maintaining features, it now arms with privacy and security protections to give you a state-of-the-art Mac experience. Don't let your Mac still be cluttered up with junks in this lovely spring season. If you used to dig around on your Mac, search for what are taking up space and decide what is safe to delete, the arrival of MacClean 3 saves that inconvenience for you. Thanks to the new Junk Cleanup feature, it gives complete and in-depth cleaning by removing all unused, developer-oriented, and extraneous junks out of your Mac. As all your everyday cleaning hassles are perfectly eliminated, you can do more with your Mac. Every time you visit a website, Internet browser will store your online data by creating caches, cookies and session files. The best way to prevent your privacy from leaks is to clean them up. The Internet Cleanup always protects you from any kind of online privacy threats by cleaning up cookies, cashes, sessions, history, saved passwords and other website data in your Safari, Chrome, and Firefox. Consequently, your online personal data will never be at risk. Cookies play a good role when they record your identification and save your time from repetitive log-ins. However, as small and unencrypted, text data are vulnerable to attackers. Through modifying cookies, some rogue applications may easily seed backdoors into your system, trace the information they want and get control over your Mac. MacClean puts comprehensive and solid protection upon your life by clearing out all these malicious cookies. How to leave your Mac pure and trace-free after you work with it? MacClean is right for you. For the first time, you'll be able to erase your trace of recently opened apps, documents, file folders and even the web servers you have been connected with. In addition to this, you can confirm the deleted iMessages and FaceTime history have been removed completely and would never be fetched back. The new MacClean 3 now features substantial security protection to keep your Mac not only away from Malware, Trojan, Spyware, Worms, Scareware, AdWare, but also all kinds of viruses. Equipped with top-level security technology and the most advanced killing engine in handling malicious threats, MacClean 3 makes it easy for you to manage your security, which makes it harder for anyone you may not want to access your information. 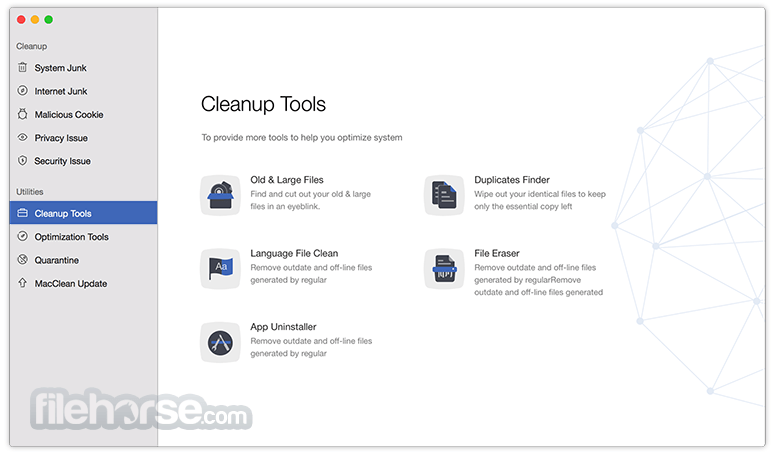 MacClean 3 has turned your tedious Mac cleaning and maintaining routines into one-tap journey. It’s easier than ever to remove old & large files, unneeded iTunes backups, useless duplicates and extra languages files out of your Mac in an eye blink. Or you can uninstall apps and extensions thoroughly without any leftover. As MacClean 3 puts everything you need in one place, it's just about the time to start this perfect spring cleaning on your Mac.